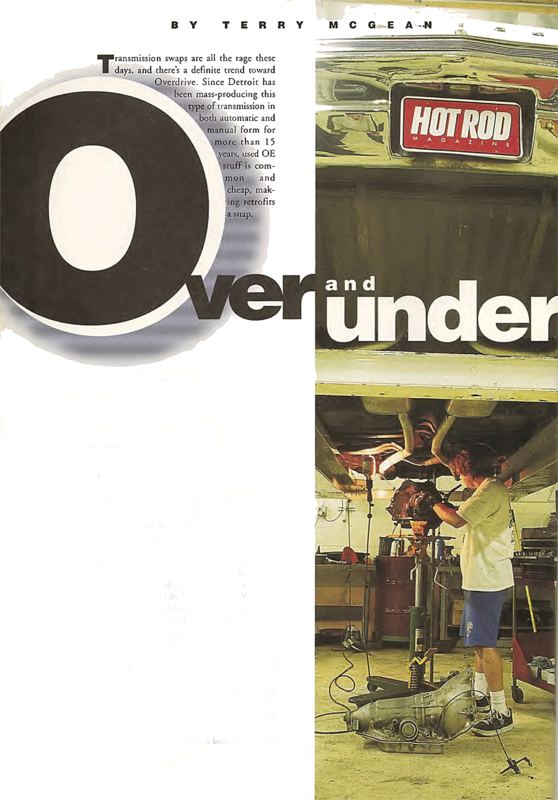 Click here for Hot Rod Magazine! Of course, there are those who balk at the suggestion, pointing out that late-model hardware in an old skin might be easy for Chevy and Ford guys, but not for those with more particular tastes-guys who dig cars and engines that haven't been made for decades. One of our friends motors a '67 Buick Skylark daily, and he was sick of the lame two-speed automatic trans behind its 340 four-barrel V-S.
looked as if it had been hole-sawed and sheet metal fins tack-welded to the torque converter. We turned up a 200-4R at the Pick-Your-Part salvage yard. It was offered in various GM passenger cars beginning in 1981, but some cars were equipped with three-speed automatics while other (full size models) used the 700-R4. We wanted one of the latest examples because it would include all of the running upgrades GM instituted over its life (1981 - 1990). We passed on full size cars, and wagons in particular, because their gross weight and the possibility of trailer - towing degraded the odds of finding a sound unit. We settled on the one from this '86 Cutlass, which was likely to have all the upgrades and showed bright red fluid. Two of use yanked the 200 in about a half - hour; in another hour, some cleaning solvent and a wire brush had it looking almost new. Be careful not to spray water haphazardly, as it can get inside through the dipstick tube bore, the vent, the cooler line fittings, and the output shaft. We took the torque converter, the dipstick and tube, and the throttle - valve (TV) cable and bracket from the donor car as well. Hang on to any hardware, as much of it is metric and won't interchange with older fasteners. The 340 and its 300ci cousin are kind of like mini nailheads. In '68, Buick retired them in favor of the new 350 small - block, which was a smaller version of the big - block Buick V-8s that debuted in 1967. 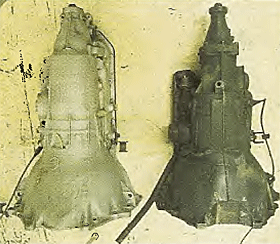 Despite the demise of this engine, the bellhousing pattern is the same BOP configuration used for many years following, and allows the later 200-R4 to bolt up. Begin by disconnecting the batter. We found it easier to access the top two bellhousing bolts from the engine bay. 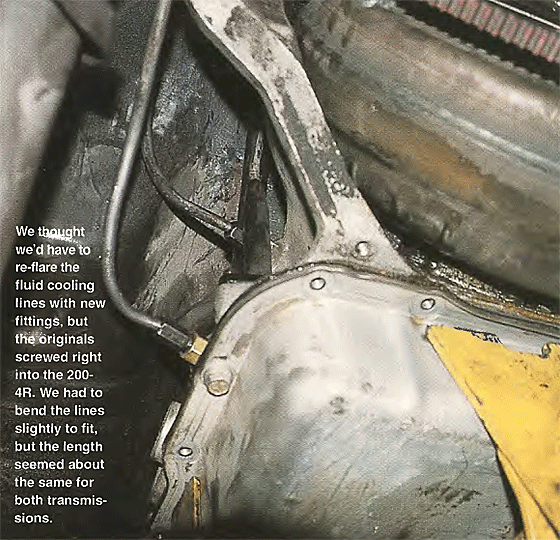 Remove the fluid cooler lines from the passenger side of the transmission case. 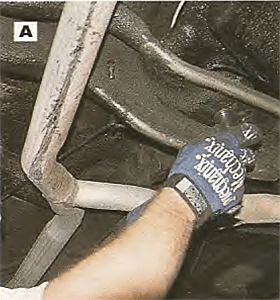 Use a line wrench if possible, and don't mangle the lines or the fittings, as they will be reused. 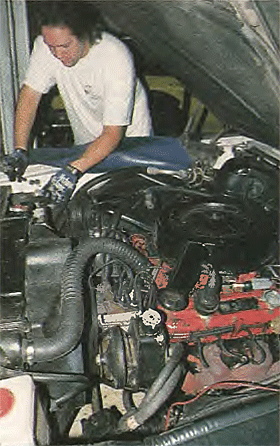 Some mechanics find it easier to remove the lines after the trans is partially lowered from the car. 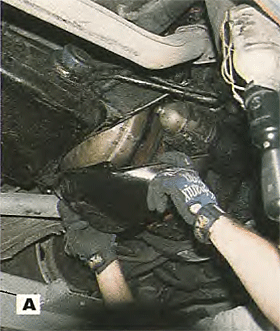 Underneath, we begin by removing the cover over the flexplate and torque converter (A) and then pull the starter. 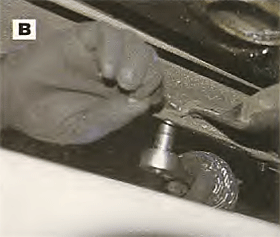 Unfasten the three bolts that hold the torque converter to the flexplate (B). You'll have to turn the engine (by hand) to expose each bolt individually. When all three are out, push the converter back towards the transmission. 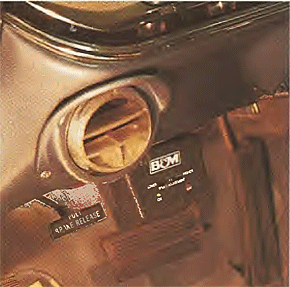 Buick's Switch-Pitch function had long since capitulated and seemed to be locked in the low rpm stall, making it a real pig out of the hole. 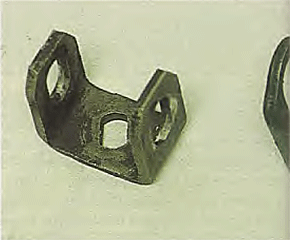 Unbolt the transmission mount from the crossmember (A) and unbolt the crossmember from the frame (B). Because the trans sits on the member, and the member sits on the frame, everything will stay in place without the fasteners. Pull the driveshaft, unscrew the speedo cable, disconnect the shift linkage, and remove the four remaining bellhousing bolts. 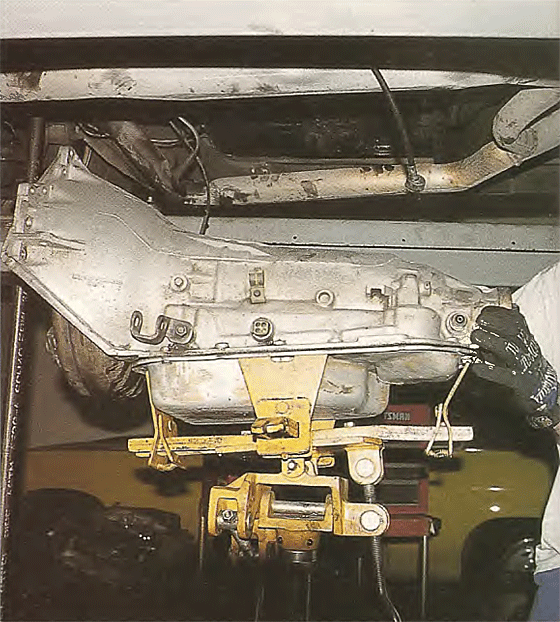 Then, with the transmission jack (or a suitable substitute) supporting the trans, slide the crossmember back and lower the transmission from the car. After bolting the trans mount from the ST300 to the 200-4R (they both have 3 3/4-inch bolt spacing), we hoisted it up into the Buick. Positioning it behind the 340, we cinched it up with the original bellhousing bolts. With the ST300 lined up with the 200-R4, we verify a common overall length of 27 3/4". The main physical difference is the position of the transmission mount; the ST300's pad is 20 1/8 inches from the bellhousing while the 200-4R's is 26 13/16 inches from the bellhousing. 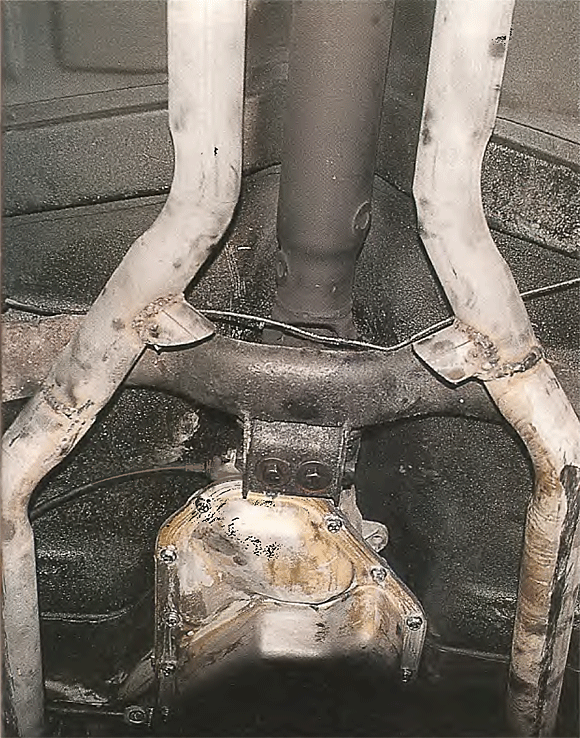 That difference might appear to be a problem at first, but the TH400 also has its mount pat 26 13/16 inches from the bellhousing, and since our Buick was available with a TH400, the crossmember should mount in that position without a problem. pattern. General Motors introduced the 200-R4 in the '81 model year, and the most common applications are A- and G-body vehicles (Caprice, Delta 88, Regency 98, Electra, LeSabre, Bonneville, Catalina). One of our concerns regarded torque converter mounting. A specialist had noted that the Buick would have a flat flexplate while most Chevy ones have a raised pad around each torque converter mounting bolt. The problem would be that the converter hub would seat in the back of the crank before the mounting lugs were flush with the flexplate. We thought it might need spacers, but since our trans came from an Olds engine, which also uses a flat flexplate, the mounting lugs on the converter had the proper dimensions and bolted up perfectly. Like many GM flexplates, ours was drilled with two patterns; the 200 used the larger of the two, which are intended for a TH400. '80s Monte Carlos with OD used it). Though we've outlined the swap of a 200-R4 in place of the ST300 two-speed in our oddball 340 - powered Buick, it will work just as well with Pontiac or oldsmobile V-8s. 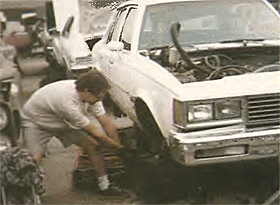 When we finished, the Buick was able to lunge from stoplights as well as loaf down the freeway sipping fuel. After the first week on the road with the new trans, calculations reveiled a 60 - percent improvement in fuel economy. It was well worth the effort. 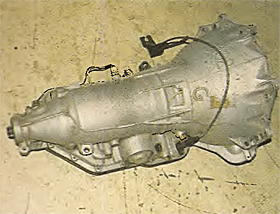 Since the Buick's original crossmember is flat and straight across, it partially blocks the 200's fluid pan, which extends nearly to the end of the case. We averted the problem by using a Chevy crossmember, which is tubular in design and curves rearward so that a separated platform, welded to the member, can "reach" forward to accept the trans mount. Most '64 - '72 Chevelles use this type, which bolts into the Buick. We found ours at Memory Lane classic auto salvage in Sun Valley, California. 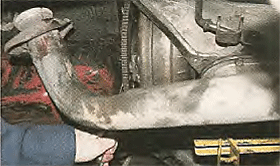 Incidentally, if your car has custom - bent dual exhaust (like ours), your pipes may not clear the crossmember after it is moved rearward. This situation required the removal of the crossover tube in our system. 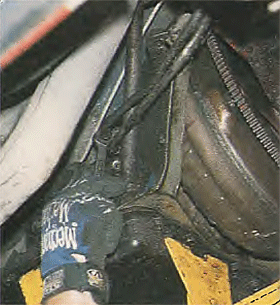 Below: A 200-4R throttle-valve (TV) cable resembles the kick-down cable seen on TH350s, but it actually functions as a throttle position sensor for the transmission, raising line pressure as the throttle opening increases and providing input for shift points. The TV is so vital to proper shifting that the 200 doesn't use a vacuum modulator, like the TH350 and 400. Our Buick's original Carter carb had no provision to connect the TV, since the ST300 didn't use a kick down cable. 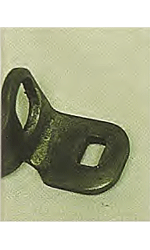 By using an Edelbrock kit (PN 8011) intended for a Ford automatic trans lever of similar function (inset), we were able to provide a lever for the TV cable (A). We modified the mounting bracket from the donor Cutlass Q-Jet to fir the back of the Carter and adjusted the cable using the factory ratcheting slide (B). Left: The shift linkage attachment from the ST300 (left) centered on the spindle in the trans, while the one from the 200 is offset. We simply bolted the Buicks original to the 200 and connected the rest of the column shift linkage, which worked perfectly. The 200-4R's lock-up torque converter was originally controlled by the onboard computer of the host Cutlass, but since our '67 Buick has no ECU, we needed a control for the lock-up function. B&M offers this control kit for the lock-up converter, which also allows the driver to alter the timing of this operation. Omitting the lockup is not recommended, as the converter will slip excessively in Overdrive due to the extra load. The B&M is easy to install. 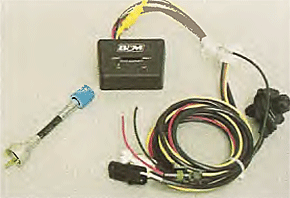 First, connect the 3-inch cable to the speedometer output of the trans, and then connect the speed sensor, also provided in the kit, to the short cable. 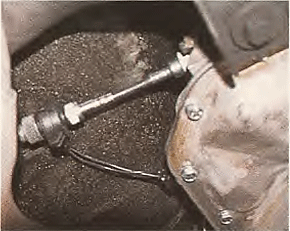 The factory speedo cable will then connect to the speed sensor.